After a hard day of running for your life, escaping a horde of cannibalistic day-traders, or even just trying to rebuild the shards of your previously idyllic life, nothing is more comforting than a nice steaming bowl of chowder. Whether you are cooking over an open flame, or using a bit of gasoline in an old tin can, this recipe is easy to prepare, filling, and will help you mask the despair of life on the edge. Put a quarter-pound of butter in a stewpan. Add to it 2 tablespoonsful of flour, 1/2 pint of milk. Chop some vegetable finely, and add. Stew together a quarter of an hour. Before it starts to get skungy, beat the yolks of two eggs, add of a pint of cream, and a little pepper and salt to taste. 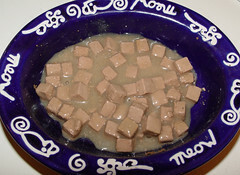 Thanks to JeffrB for the picture of cat food. Also cooking: humor-blogs.com and alltop. Not to mention these people who are about to take over the world. Ohhh… I’m definitely in the mood for some chowder now! Yeah, after the beating the TSE took yesterday, I should have called it BAY Street Chowder.